The limb of the instrument carries a scale of 90? numbered by groups of five in a separate scale and subdivided to 2?' in a third. 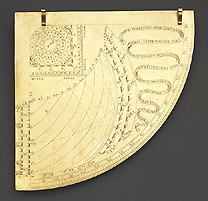 Above this the left and centre of the instrument is filled with the diagram for an Italian hours dial (9 to 24 without subdivisions) the morning hours being indicated by smooth lines, the afternoon hours by dotted lines. On each side of the diagram the two halves of a zodiacal calendar reading to 5 days and degrees (with 0? Aries at 11 March) are marked, and the remaining space at the right of the instrument carries the inscription 'LINEAE PERPETVAE ANTE MERIDIANAS HORAS INTERPVNGTAE VERO POMERIDIANAS INDICANT AD ALTITVDINIEM POLI GRADVVM XXXXIII' followed by the signature. Above the hour diagram is a shadow square reading to twelve by groups of three, each group subdivided to 15 and cumulatively numbered to 60. The Vmbra recta indication is written 'VMBRA RETTA'. Within the shadow square is a circular table labelled 'TABVLA SOLIS MOTVS' (Table of the sun's motion). Along the longer edge of the instrument are two scrolled block sights, the foresight with scalloped engraving on its curved surface. To the back of the instrument an iron mounting is attached consisting of a plate riveted to the quadrant carrying, by a screw and a wing nut, a semi-circular support. Pivoted to this, and adjustable through 90?, is a spike which may be clamped in any desired position by a wing nut. Since the rivets attaching the mounting assembly break the engraving on the face of the quadrant, the whole would appear to have been added after the quadrant itself had been completed.